You are here: Home / Commentaries / Shutterbug, Spare this Tree! 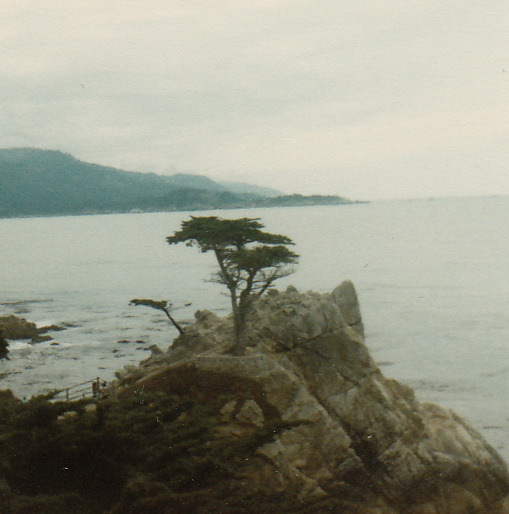 [Editor’s note: In 1990, the Pebble Beach Company (“PBC”), which operated the famous “17-Mile Drive” in Monterey, California, denied a commercial photographer permission to photograph the famous “Lone Cypress” tree that sits on its property. The tree, PBC claimed, was its trademark. PBC’s position raised a few eyebrows, attracted some media attention, and inspired the following tongue-in-cheek analysis of its claim under intellectual property law. 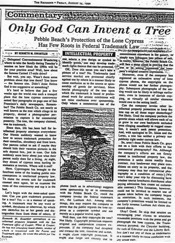 It was first published in the August 24, 1990 issue of The Recorder, then a San Francisco Bay Area daily legal newspaper. That issue was distributed widely at the opening of the California State Bar Annual Meeting held that week in Monterey, which explains some of the other references. Welcome State Bar delegates and conventioneers! Wondering where to take the family during Tuesday’s session on how bleak the 1990’s will be for your practice area? Well, how about the famous 17 Mile Drive? But wait, you say. Wasn’t there some problem about that tree there? You know – the famous one? Didn’t Sen. Jesse Helms find it too suggestive or something? Remember? The Pebble Beach Co., not nearly as well known as the tree which clings to its property, denied a photographer permission to capture it for commercial posterity. The tree, the company claimed, was its trademark. Since then, life has been hell for intellectual property attorneys everywhere. Our friends started asking where to register their camellias, shrubbery and koi ponds. Our parents called to ask if maybe they should stash their vacation pictures in the safe deposit box, y’know, just in case. Our kids suddenly seem leery about just what we really do for a living. They have nightmares of cypress trees hurling cameras at tourists, like the apple grove in the Wizard of Oz. And say, isn’t that Ansel Adams turning over in his grave? Here! Lone Cypressgate has brought to the forefront some of the leading public misconceptions about intellectual property law. To make the streets safe for trademark counsel once again, let us examine the roots of this controversy and nip it in the bud with arbor – err -ardor. Let’s begin with the most-asked question: can you gain trademark protection for a tree? Yes – in a manner of speaking. A trademark may be any word or symbol, deciduous or otherwise, by which one identifies his or her goods and distinguishes them from those of others. If you select a tree design or symbol to identify your goods, you may be able to develop protectable trademark rights therein. OK. Does this mean you can’t photograph a tree? No. Trademarks are protected chiefly against use by others in a manner likely to cause confusion as to the source or sponsorship of goods or services. Mere tourist photography of the tree upon which a trademark may be based, or professional work for artistic exhibitions, will not raise confusion over sponsorship. Only where commercial use of the photos (such as advertising) suggests some sponsorship by or connection with the Pebble Beach Co. could the company invoke the Federal Trademark (Lanham) Act. Among other things, this may require the company to prove that the public regards the Lone Cypress as their corporate symbol and not merely a lovely seascape or popular tourist sight. Well then, can they copyright the tree? Not likely. Copyright protection requires original and independent creative expression. Had the company designed and created the tree, coastline, ocean and lunar tidal pull, it might claim copyright protection. It might also be content simply to turn infringers into pillars of salt. In reality, however, the Pebble Beach Co. may face a steep climb in proving that the tree or its setting represents the company’s original creative expression. Can the company invoke other intellectual property protection to keep the lens cap on all those eager shutterbugs? Not likely. Until the company perfects the genetic strain which will allow each of us to grow in our own backyards wind-worn trees clinging steadfastly to rugged coastline against blasts of salt ocean spray, it needn’t seek patent protection. And, with apologies to Dr. Seuss and the Lorax, a tree has neither a privacy nor publicity right under current law. So aren’t these Pebble Beach Co. guys out on a limb with their efforts to bar commercial photography? No. Although the company’s efforts are not firmly rooted in intellectual property law, the protection it seeks stems readily from contract law. This limitation, however, could not be invoked to restrict use of photos taken before the company began its restriction. In such instances, the company’s protection would be limited to the Lanham Act (trademark) claim discussed above. Okay? Good. So skip that session on encouraging your clients to articulate reasonable positions with the press, and go photograph the Lone Cypress, the Transamerica pyramid, the Chrysler building, the rock of Gibraltar and the Liberty Bell. Just don’t use any of them as trademarks in a manner likely to cause confusion with any senior user. Copyright 1990, 2008, 2012 by Ken Kwartler. All rights reserved. 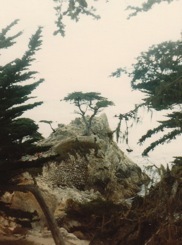 Lone Cypress photos Copyright 1983, 2009 by Ken Kwartler. All rights reserved. Copyright 2008, 2011, 2015 Ken Kwartler. All Rights Reserved.